If I had a nickel for every time a guy asked me about the best face oils for his skin, I’d have about … fifteen cents. But loyal lady readers, some of you have a few nice men in your lives, and if you want to ease them into green skincare with a nicely packaged, effective starter face oil, may I recommend Meow Meow Tweet’s Face Oil? Though not marketed specifically for men or women, I could easily see Meow Meow Tweet’s Face Oil being a big hit among men. Made with skin-soothing ingredients such as hempseed oil, jojoba oil and sesame oil, and spiked with a grounding dose of vetiver, patchouli and juniper, Meow Meow Tweet’s Face Oil is something of a stiff cocktail for skin that’s been a bit mistreated and could use a helping of simple, yet beautifully effective, moisturizing oils. The scent isn’t girly at all, yet it’s not so over-the-top masculine that it would be out of place in any beauty buff’s collection. 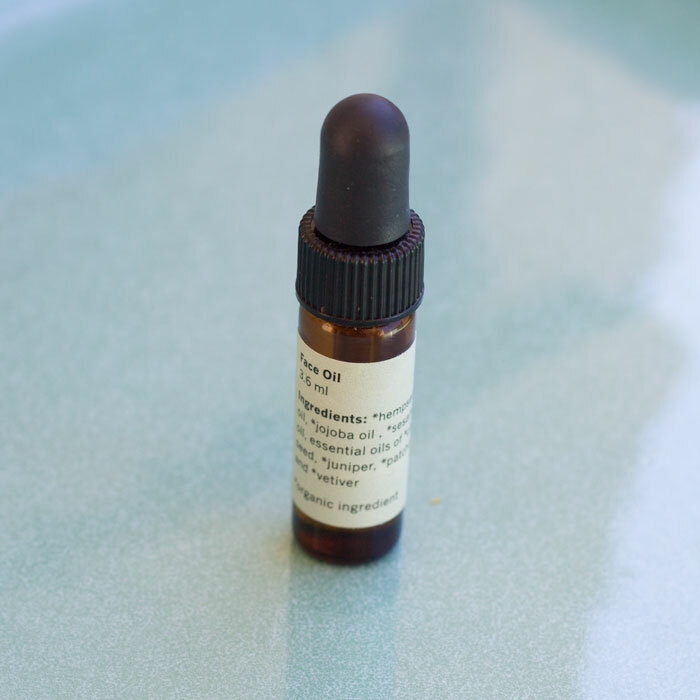 I’m a huge scent person, and while personally I’m not crazy-drawn to the scent of this oil on my face, when I catch whiffs of it after applying it on my hands or hair, it’s earthy and nutty (just like I like my men), and is quite comforting. On the skin, it feels featherlight, thanks to a smart combination of jojoba oil (my favorite multipurpose skin / body / hair oil), sesame oil and hempseed oil. 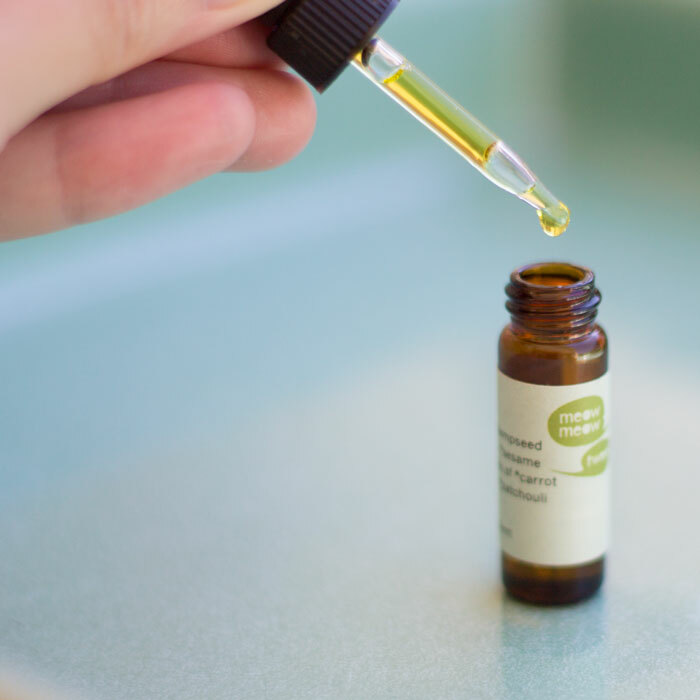 The hempseed oil gives Meow Meow Tweet’s Face Oil a very pretty bold green tint to it (thanks, chlorophyll), thinned out a bit by the rich yellows of sesame and jojoba. Hempseed oil is one of those underrated-yet-overachieving oils that delivers a shot of omega fatty acids and protein to the skin. I want to see (and feel — oh how luscious it is) hempseed oil in more concoctions. After using my Meow Meow Tweet Face Oil for a few weeks, I didn’t notice any out-of-the-ordinary breakouts, so it’s safe to say that at least on my skin, it was non-clogging and quite nourishing to the skin. 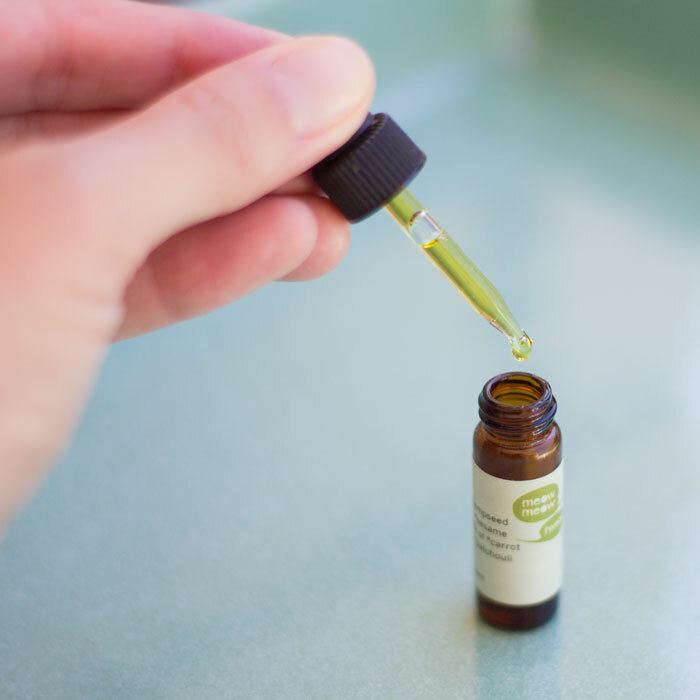 My skin drinks up jojoba oil and reacts quite well to it (it will forever be a staple in my skincare and I will forever be grateful to its powers for weening me off of ultra drying, OTC and RX acne treatments), so that earns Meow Meow Tweet’s Face Oil a big plus in my book. While this isn’t a face oil that I would choose when lined up against my darling jasmine or rose concoctions, it is one that I’d reach for when I want a chilled out, simple face oil treatment with minimal yet effective ingredients to soothe inflamed skin or to just shake up a highly scented routine with something a bit more earthy. At $25 for a full-sized bottle, Meow Meow Tweet’s Face Oil is easily one that you could feel good about stocking for those times when you just want something different. It’s not a huge investment, and it’s got all the familiar ingredients that you’ve come to love, but with a scent that’s the oddball among your somewhat-predictable face oil wardrobe. And sometimes, you just gotta love those oddball face oils. I’ll be refilling this for the cozy, earthy fall ahead. Have you tried Meow Meow Tweet’s Face Oil? What scents are you drawn to, and which scents have grown on you? What plant oils do you think are underrated? Tell me in the comments section!